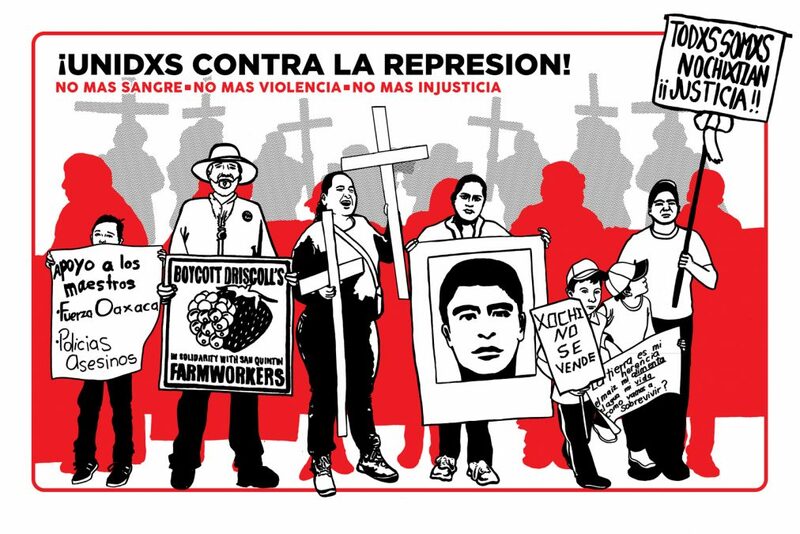 New poster edition we are donating to support fundraising for the Caravana Contra la Represión en México. This speaking tour is a collective effort to create solidarity with the different social struggles being waged in Mexico, and to denounce government repression towards social activists which takes the form of forced disappearances, assassinations, political imprisonments, land grabs, feminicide, and other forms of violence. The Caravana also denounces and demands an end to the Merida Initiative. From October 18th through November 18th, a group of representatives of 7 social movements will tour several U.S. cities making this denunciation and promoting solidarity. The speaking tour is composed of representatives of the following groups: Ayotzinapa students; Parent Assembly of the 43 missing students of Ayotzinapa; the National Coordinator of Education Workers (CNTE); San Quintin farm workers; May our Daughters Return Home (Nuestras Hijas de Regreso a Casa) from Juarez City denouncing femicide; victims of the attack on the community of Nochixtlan, Oaxaca; and Xochicuautla, an Otomi community fighting mega-projects land grabbing against indigenous communities.